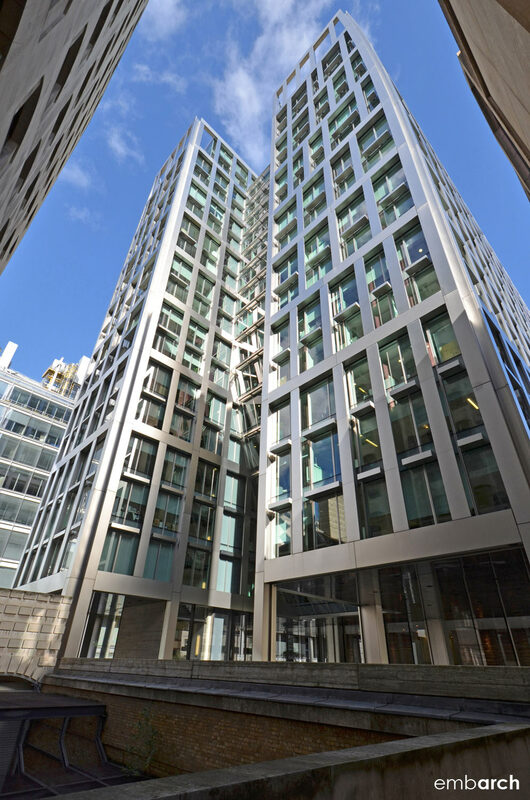 The 18 story building at 5 Aldermanbury Square in London sports two features that hold appeal for modern consumers of architecture: it uses state-of-the-art, high tech cladding material and it blends public spaces with private, commercial property. A pedestrian thoroughfare connects Wood Street and Aldermanbury Square to the upper level of the Barbican High Walk – an area rich with history since Roman times and celebrated especially as part of the post-war London Wall Plan. The building is organized around a central atrium, on either side of which a wing of office space projects forward. The architect eschewed symmetry in the building massing by positioning one office wing farther forward than the other. Regularity is further rejected in the façades, where sturdy stainless-clad framing -- with window openings of varying width -- is layered over the entire structure.